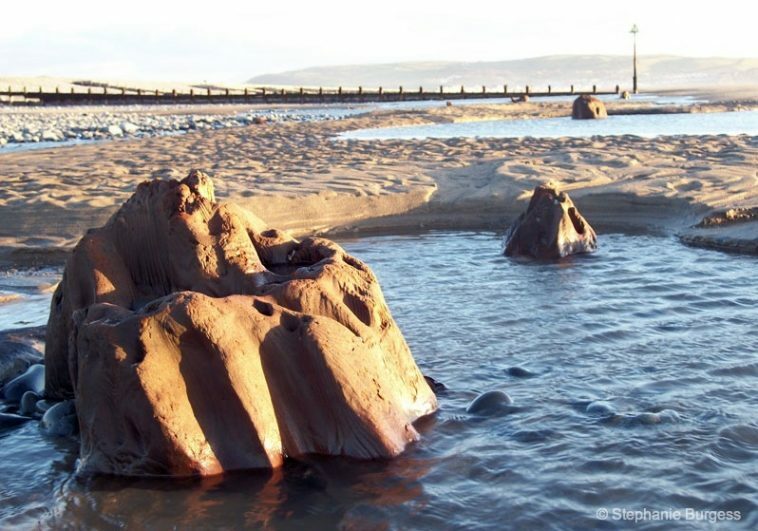 For many years I have visited the legendary Bronze Age, submerged forest (radiocarbon dated to be circa 5,500 years old) located halfway between the pretty little coastal town of Borth (Welsh for ‘port’) and the neighbouring village of Ynyslas, (Welsh for ‘blue island’ as it is situated on a sand spit) famed for its sand dunes, flora and fauna. 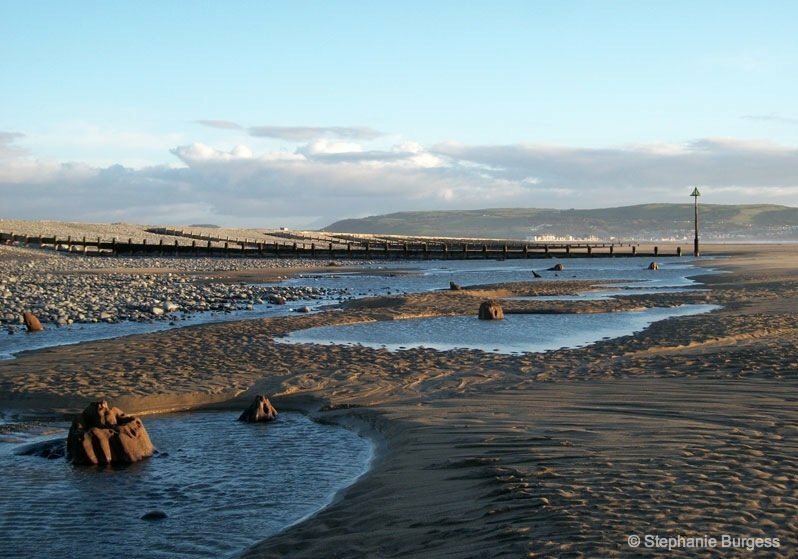 They lie at the centre of Cardigan Bay, Ceredigion on the coast of West Wales, UK, adjacent to The Cambrian Coast Railway. 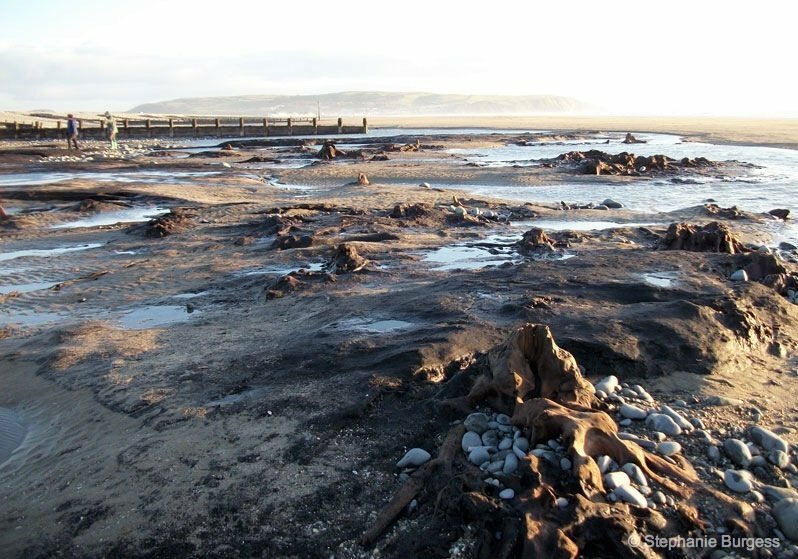 Whenever I visit this stretch of the Welsh Coast I eagerly park my car next to the golf course, and fingers crossed, hope the low tide will reveal the Bronze Age forest in all its glory. The sense of anticipation as I scramble up the pebble bank next to the sea wall, waiting for that first sighting, never fails to thrill me. As I clamber over, I am usually rewarded with the sight of a few small areas of exposed peat deposits with the occasional fallen branch and, shyly peeping through the sand, a few tree stumps. However, after the winter storms of 2013-2014 that all changed. 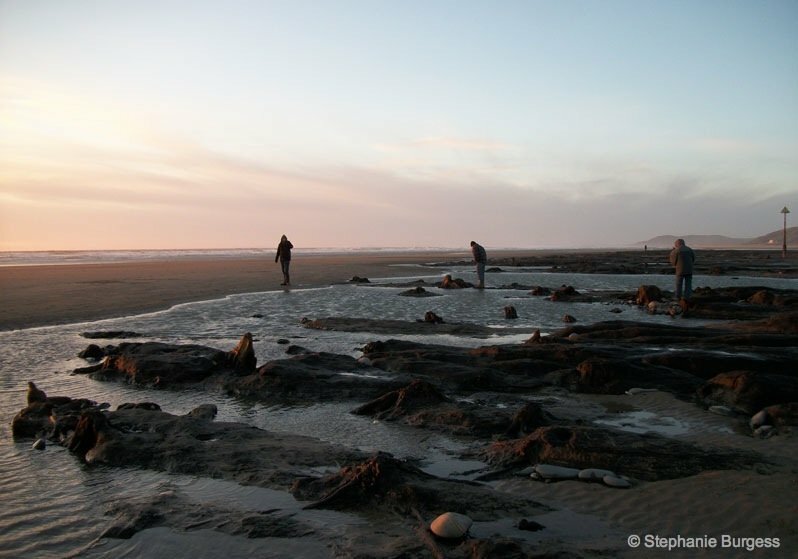 At the beginning of January 2014 I visited the site of the submerged forest hoping that, after the last storm, it would be more apparent. It had been exposed a little more but what took my breath away was the sight of the far end of the sea wall, adjoining the car park, which had been breached by the tidal surge. 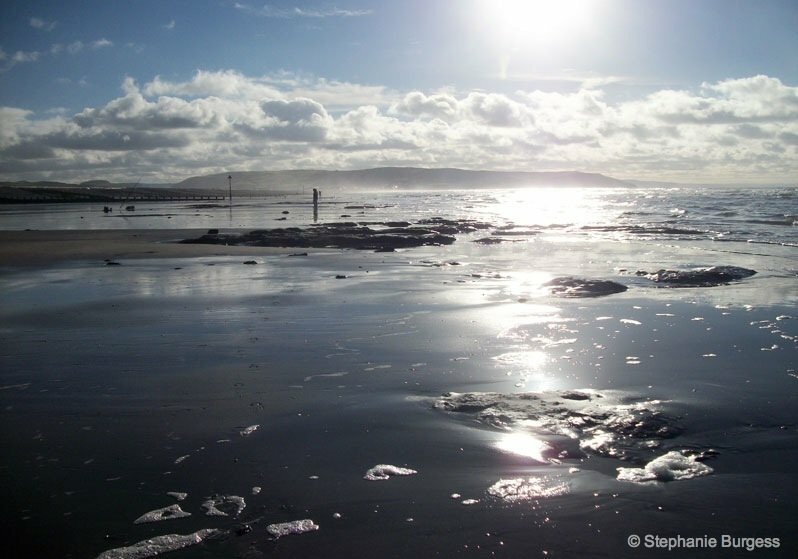 It had become a lagoon filled with saltwater, rainwater and the reflections of clouds floating in an azure-blue sky. What a photographer’s dream to capture images as beautiful as this! Unfortunately, the tide had also swamped the golf course and an army of volunteers was clearing the debris deposited there. What shocked me was how large a proportion comprised of plastics. 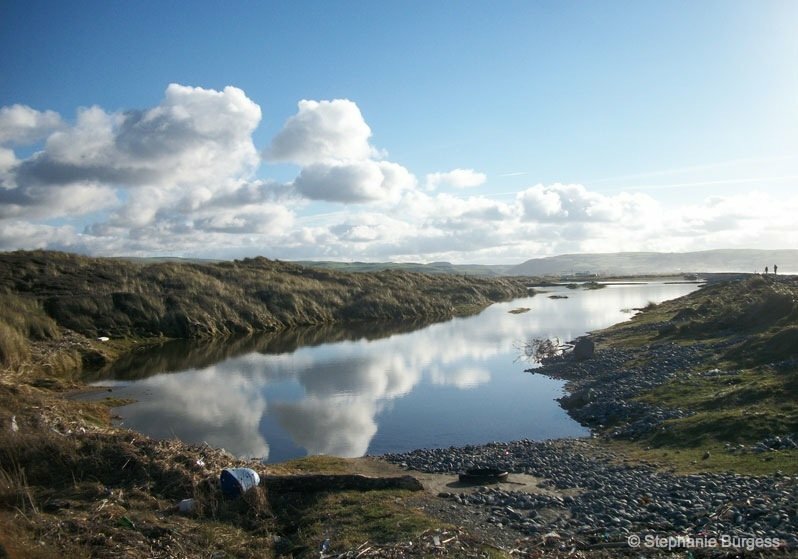 Why are so many people disposing of their waste in our beautiful rivers and seas? 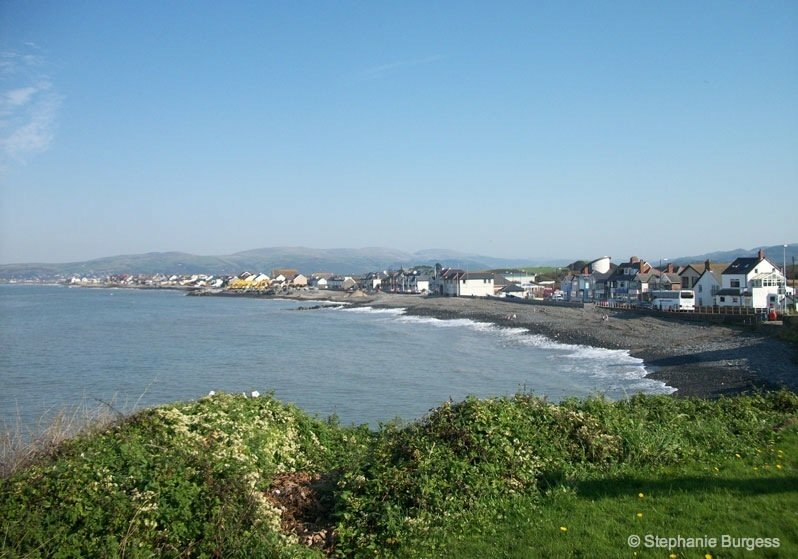 On the 12th February 2014, gales of 100mph struck Borth Beach. The result was that approximately 60cm of sand was scoured away and, on climbing over the sea wall a week later I was rewarded with the sight I had been waiting for! I stopped and gazed in wonder for a minute, exclaimed, ‘Wow!’ then set off to explore. The landscape appeared to be almost lunar with vast expanses of undulating peat deposits. 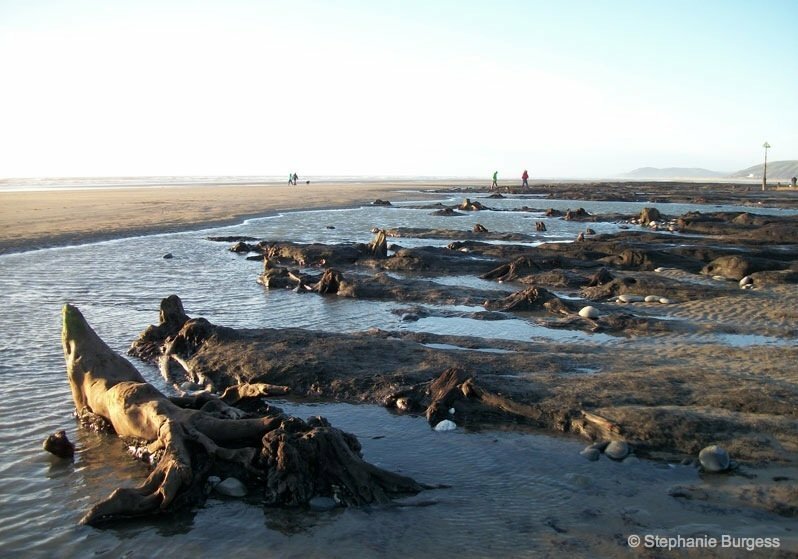 Whole root systems of the Bronze Age trees had been exposed and, instead of just a handful, there was a whole forest! It was a remarkable experience; I felt that I was walking in the actual footsteps of my ancestors; it was so surreal and I tried to imagine what their lives must have been like compared with mine. 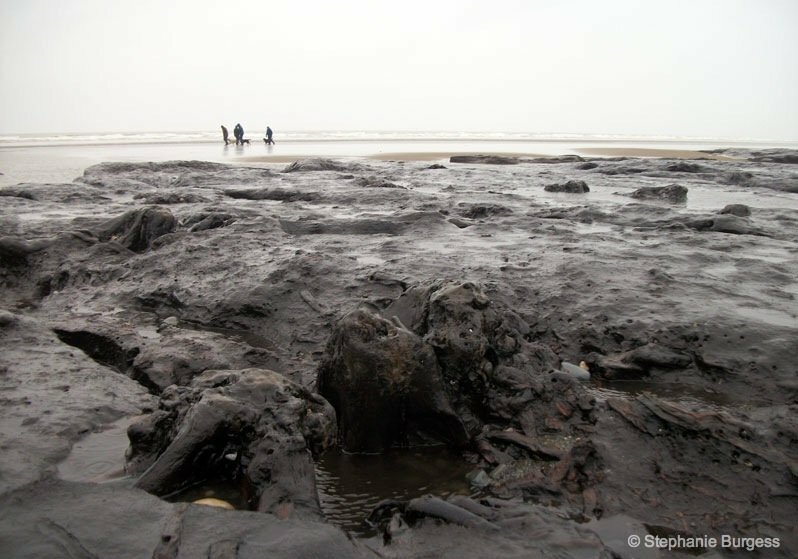 I later heard of ancient footprints being discovered at the other end of Borth beach and of archaeologists battling against the tides to make casts of them before they once again filled with sand. Thinking of my ancestors made me recall the Welsh legend of the ancient kingdom of Cantre’r Gwaelod which was drowned by the sea. 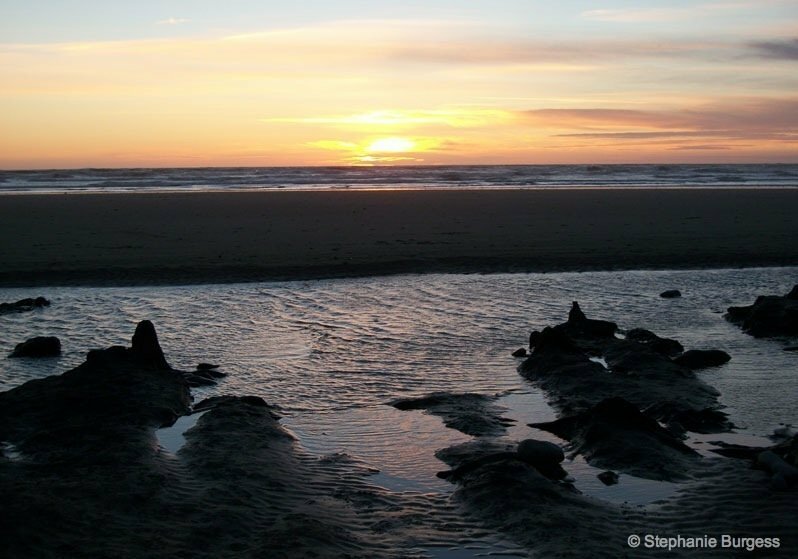 It is believed that rich farmland and a forest extended about twenty miles out into Cardigan Bay and was protected from the tides by dykes and sluice gates which were opened and closed twice daily by the gatekeeper, Seithennen. There are several versions of the legend but the most popular claims that Seithennen, who was rather partial to a drink, became so drunk that he fell asleep and didn’t shut the gates to protect the land from the incoming tide during a severe storm and most of the kingdom became submerged under the Irish Sea. 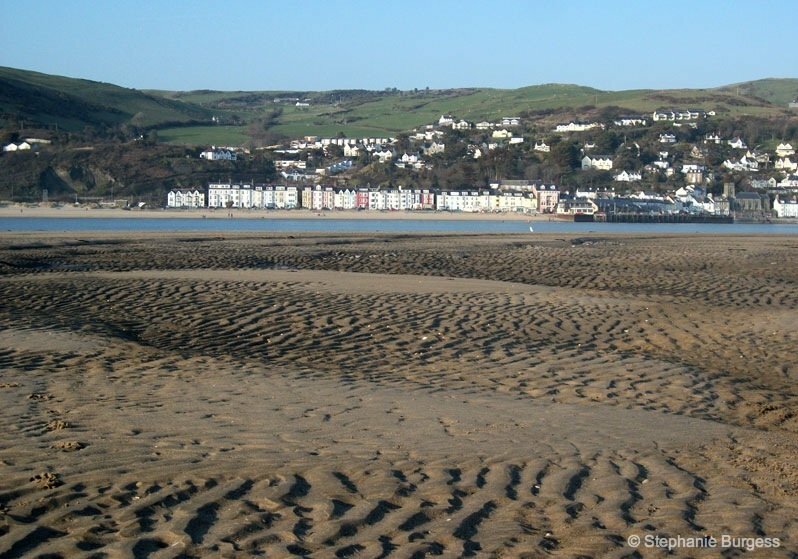 The picturesque seaside town of Aberdovey (Welsh for the ‘mouth of the river Dovey’) lies across the estuary from Ynyslas and is believed to be the only remaining part of Cantre’r Gwaelod. 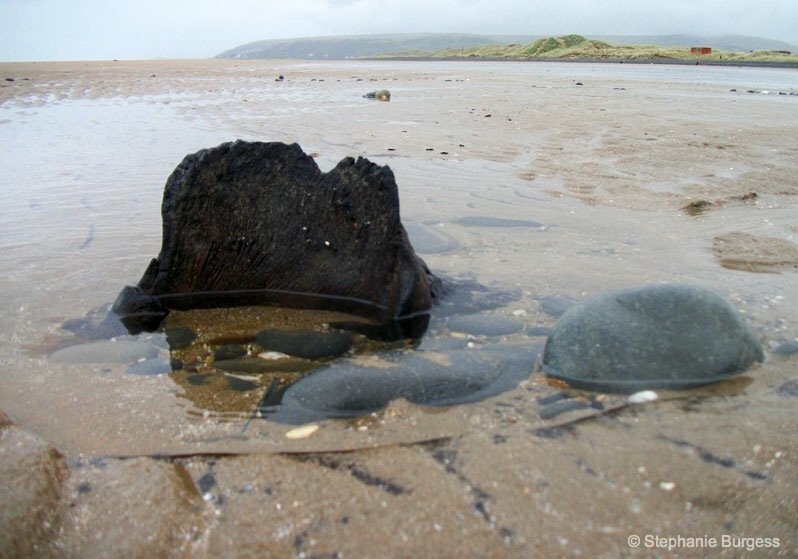 It is said that if you listen carefully when the tide is high, you can hear the bells of Aberdovey ringing under the sea as they would have when the kingdom was being lost beneath the enormous waves. I remember listening for them when, as a small child, my grandparents told me of this legend; I truly believed I could hear them. I am mother of two who have flown the nest and a 16 year old, still living at home, who is a dedicated musician and DJ. Am lucky to have been born and raised in Aberystwyth, Ceredigion, Wales. My work is with teenagers who have additional learning needs-they are such inspirational young people. Being with family and friends is so important to me. Leisure time is spent walking in the beautiful Welsh countryside and trying to capture the beauty around me with my camera. Crafting, attending live music events (everything from punk to drum and bass), and singing sad songs are other ways I occupy spare moments. It hasn’t been spelled as ‘Aberdovey’ for 40 years. The correct spelling is ‘Aberdyfi’. Nice pix though.